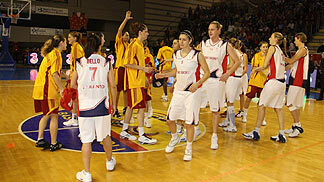 Cras Basket Taranto won the first leg of the EuroCup Women 2009 final by 12 points in front of a near capacity ground. Cras Basket kept their fans in suspense as they had to wait until the 33rd minute of the game before taking control. Ilisaine David put the home side in front for good (50-48) and was the catalyst as Cras Basket ended the match with a 19-7 run to win the first leg (67-55). Suzy Batkovic led the hosts with 15 points and 9 rebounds, while David scored 14 points. For Galatasaray it was a disappointing end to the match after setting the pace and controlling the first half of the match to lead (36-29) at the interval. Galatasaray maintained their advantage (46-34) up till the 26th minute of the game. 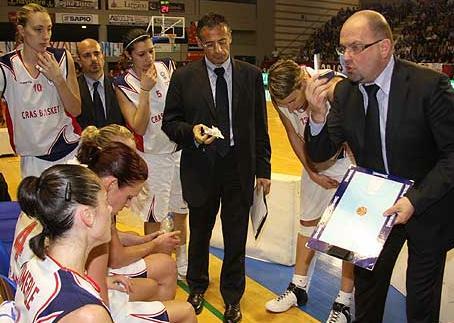 Afterwards they struggled with the defense used by Cras Basket head coach Roberto Ricchini. They did not score again in the third period and only managed 9 points for the rest of the game. For Galatasaray Seimone Augustus had 19 points and Esra Sencebe finished on 10 points. Audrey Sauret-Gillespie and Elodie Godin, the two players from France on display, scored 6 and 2 points each. Godin also had 7 rebounds. The second leg will be played on Thursday, 9 April, in Galatasaray and will be broadcasted live by NTVSPOR.